We had so much fun at last year's Ball, we couldn't wait to start planning for 2019!! Get ready for a night of glitz and glamour, all in support of people with intellectual and other disabilities. 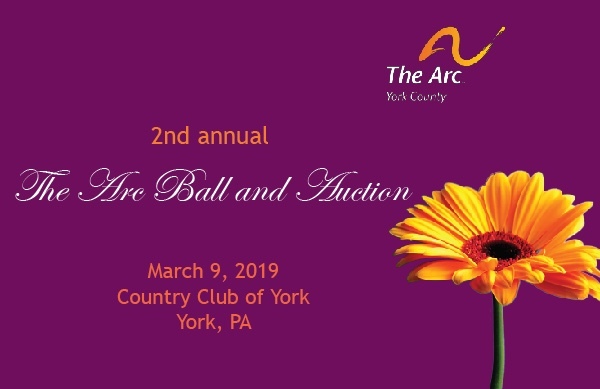 The Arc of York County's second annual The Arc Ball and Auction will take place at the Country Club of York on Saturday, March 9, 2019 at 6:00 PM. The black-tie optional affair will feature a lavish cocktail reception, a formal dinner, a fantastic lifestyles auction, and hours of dancing to Central City Orchestra. It's sure to be a magical night... all to raise money to benefit people with disabilities in south central Pennsylvania! For more information, please contact The Arc of York County at (717) 846-6589 or email Jim Poster, Director of Development.